Faux amis | One quality, the finest. Paris’ Opera Garnier is lit by a glorious crystal chandelier, designed by the architect Charles Garnier. The huge chandelier was criticized at the outset for potentially obstructing the view of the stage for those in the nose-bleed seats, as well as the view of the magnificent painted ceiling. 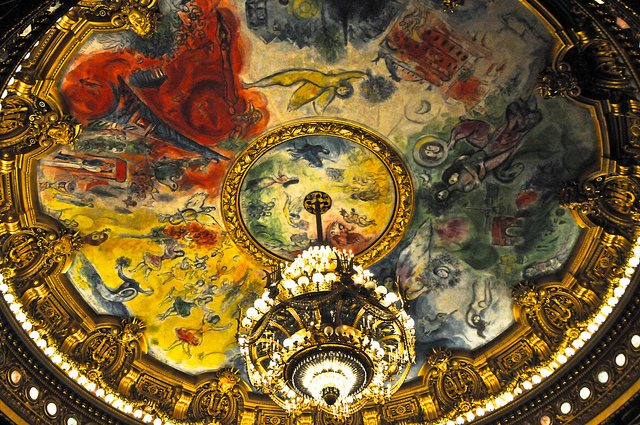 (At the beginning, the ceiling was painted by Eugène Lenepveu, but it was replaced in 1964 with a painting by Marc Chagall.) Garnier defended the 7 ton light fixture, saying, “What else could fill the theatre with such joyous life?” On May 20, 1896, however, the great chandelier didn’t create joyous life. A counterweight fell causing the chandelier to crash into the audience. The spectacular disaster inspired the dramatic scene in The Phantom of the Opera, but it did also result in the death of an audience member. I’ve sat in those nose-bleed seats with a magnificent view of the stage, ceiling, and chandelier, and I agree with Garnier that his magnificent chandelier fills the Opera with joyous life. I just hope all the bolts are good and tight. The word “chandelier” is one of those faux amis (foez amee) or “false friends” of the French language. This term is applied to words that look like an English equivalent, but don’t mean the same thing at all. They mislead you, like an untrustworthy companion. In French, a chandelier that hangs from the ceiling is un lustre (uhn loostruh) while un chandelier (un shan-del-ee-ay) is a candle holder. A 7 ton chandelier that doesn’t stay in the ceiling would, indeed, not be a true friend. This entry was posted in Architecture, Theater and tagged Charles Garnier, Eugène Lenepveu, faux amis, Marc Chagall, Opera Garnier chandelier, Phantom of the Opera. Bookmark the permalink.